Implementing a sharps safety program is the best defense against sharps-related injury. OSHA recommends that institutions look at their needle devices to determine safety and check how sharps are being handled and disposed of. Part of this process includes choosing the right sharps container to keep sharps out of the trash and held in a safe receptacle prior to disposal. Sharps containers are regulated by the FDA as a Class II general hospital medical device through the authority of the Federal Food, Drug, and Cosmetic Act. It has published a detailed list of questions product evaluators should ask when selecting a sharps container that manufacturers should consider in the design process. These include puncture resistance, safety features, opening and closing mechanisms, potential for spillage, ease of use, safe transport, autoclaving capability, handling procedures, container color and warning labels, overfill protection, container access, mounting systems, and cost effectiveness. The CDC also offers a “performance criteria” for sharps disposal containers, outlining what is required for safe containment and accessibility. This criteria includes functionality, accessibility, visibility, and accommodation. The easiest way to select the right sharps container is to work with a certified and responsible medical waste disposal company like Red Bags. 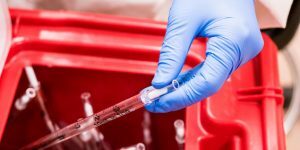 When you work with Red Bags, you are working with a company who can help you manage all of your medical and pharmaceutical waste disposal needs, including purchasing the right sharps container for your facility. We can ensure your staff’s safety and your company’s regulatory compliance through our online OSHA Compliance Training program.